Marine communications are more important than ever, but the solutions that work on land don’t work at sea. Fortunately, we live in an era when satellite communications are the answer for everyone from the most casual boater to the most sophisticated cruise ships. Everyone from recreational boaters to megayacht owners to commercial fishing and marine transport companies need reliable communications on the water. Cellular services work only a few miles offshore, and are completely unavailable in most coastal regions. VHF radios are required for communicating with other nearby boaters, but aren’t really options for ship to shore communications. Satellite communications provide the coverage that boaters need, and have grown to offer services that rival land-based communications. The industry started with the founding in 1979 of the International Maritime Satelite Organization (Inmarsat) as a not-for-profit international organization, set up at the behest of the International Maritime Organization (IMO), a UN body, for the purpose of establishing a satellite communications network for the maritime community. In the subsequent years, Inmarsat has been privatized, many other companies have launched commercial efforts for large vessels with C-band and other satellite technologies throughout the eighties and early nineties, and new Low-earth Orbit providers Iridium and Globalstar introduced services in 1999 and 2000 respectively. Marine satellite communications services cover the entire gamut of communications, but there are key areas that customers need depending on their situation. Common services include voice calling, data services for satellite email and Internet Access, and weather and oceanographic data access for navigation and fishing. Many vessels also use satellite vessel tracking services in order to keep shoreside operations apprised of their location. Distress alerting has also been one of the driving forces in satellite adoption on the water, with GMDSS services, Personal Locator Beacons, and more recently Satelite Emergency Notification Devices like SPOT and Delorme Inreach. Voice calling keeps recreational vessels in touch with family, friends and businesses back home; commercial vessels use voice calling for ship operations and crew morale. Voice service is available from Inmarsat and Iridium. 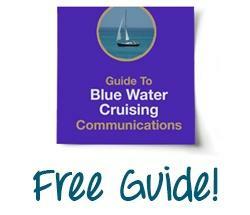 One of the most efficient ways to communicate on the water is through satellite phone email. However, because satellite data services are either much slower or more expensive (or both) than land-based data service, specialized satellite email service is required to have the best experience. Satellite phone email service can provide up to 20 times faster service than using uncompressed service, and in many cases can make the difference in whether email service can be used over satellite data at all. Satellite email services also allows boaters to send a single message to a virtually unlimited number of recipients with the press of a single button. Additionally, satellite phone email service can be used for related services such as retrieving GRIB files, posting GPS locations, or updating blogs and social media sites. Many vessels are now deploying (Voice over IP) satellite VoIP services to take advantage of the lower data rates. This solution requires using VoIP service that is specifically designed for satellite. Buyers should look for a VoIP service that uses no more than 1MB per 20 minutes of talk time, as this will give the best payback, and can reduce voice per-minute pricing by more than 50% compared to standard voice service. Satellite VoIP service also makes crew calling easier because cards can be sold on a prepaid basis independent of a satellite service provider. Marine satellite Internet access is available at a number of different speeds and prices. For limited browsing, many boaters find that a setup as simple as an Iridium satellite phone with its 2.4 kbps uncompressed data feed will work to browse mobile sites and get weather data when used with specialized satellite weather software. Newer satellite broadband services are available such as Iridium OpenPort and Inmarsat FleetBroadband that can provide an experience similar to DSL/Cable service when used with satellite compression software. However, many satellite broadband users have run into “bill shock” after inadvertently downloading megabytes of unwanted data such as windows updates or Skype sessions when they connected their computer to an open satellite broadband line with no firewall in place. Satellite firewall routers are critical in any satellite broadband installation to ensure maximum speed and block unwanted traffic. At the most sophisticated end are VSAT installations and Inmarsat FleetBroadband VLA services that can provide very high speed access, generally at prices that make sense for commercial ship operations or for megayacht owners. These services also rely on satellite network management routers and services to manage crew and passenger prepaid voice and data access, as well as complex ships operations. An effective router can reduce bandwidth dramatically through compression and blocking unwanted data-hogging sites and services. In summary, there is a maritime satellite communications service for everybody who spends time on the water. Care must be taken to select services and equipment that is developed specifically for satellite to get the best pricing and experience. The best way to do this is to consult with an experienced satellite communications specialist.